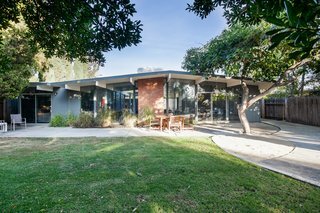 A bright and beautifully updated SoCal Eichler house seeks a new owner. 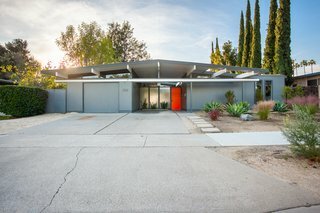 Without a doubt, Joseph Eichler's midcentury tract homes have had a huge impact on contemporary architecture. 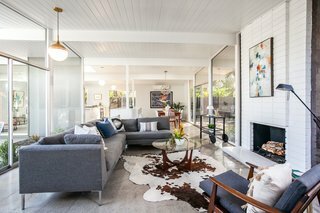 Designed to be affordable homes that would allow an indoor/outdoor lifestyle in California's temperate climate, they have definitely stood the test of time—but not without the necessary renovations to help usher them into the modern era. 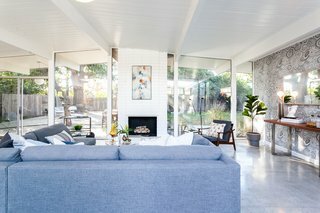 Located in the Fairhills Eichler tract in Orange, California, this 1960s atrium-style Eichler shines with updates—including a bright and airy open floor plan and a light-filled central atrium. 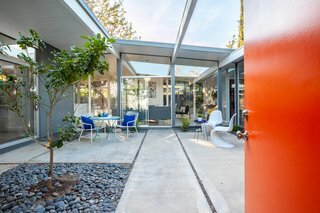 Classic post-and-beam construction and a bright orange door create a sunny facade for this updated Orange County Eichler. The entrance takes you straight into the central atrium. 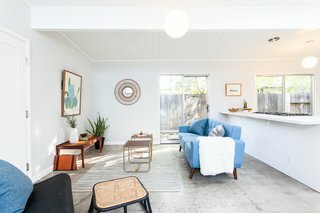 In addition to its beautiful polished concrete floors, 586 S. Woodland Street also boasts custom closets, an updated kitchen, and renovated bathrooms. 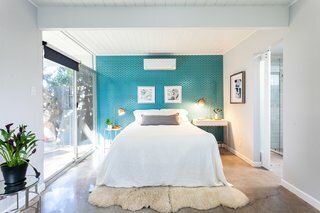 The home also underwent practical and necessary updates that include re-insulated walls and an updated foam roof. The atrium view from the side angle. The open-plan living room is bright and airy with natural light from multiple sources. 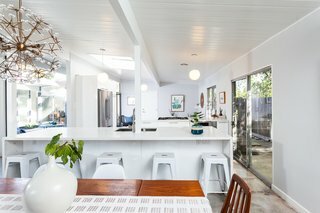 The living room flows into the dining room and the kitchen for easy entertaining. 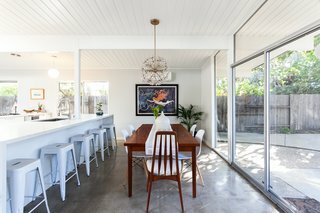 The polished concrete floors add a sophisticated touch. 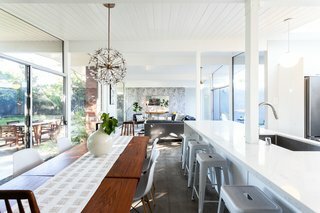 The dining nook sits between the kitchen island and a wall of glass. The view from the dining area looking into the living room. 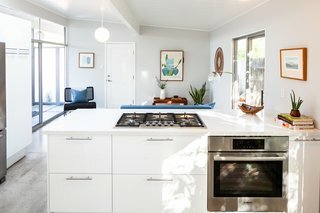 The renovated kitchen features a sleek island-peninsula, allowing seamless indoor/outdoor flow from the glass-walled exterior to the inner atrium. The kitchen features period-appropriate globe pendant lighting. On the opposite side, the kitchen overlooks a sitting room. 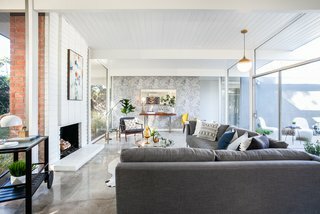 Sliding doors connect the space with the outdoors. 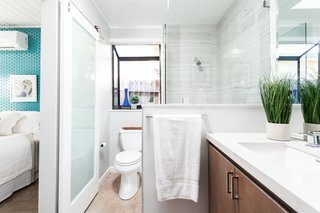 The master suite includes an updated ensuite bathroom and sliding doors which open to the backyard. A sliding door was also added to the bathroom during the renovation. 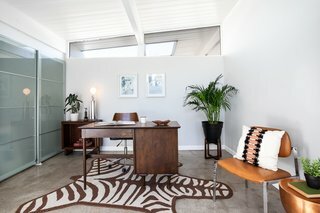 One of the home's four bedrooms can easily serve as an office space. 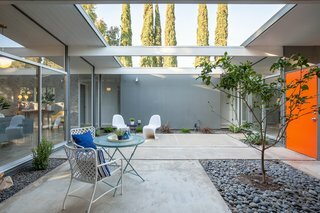 The spacious backyard features mature trees, including avocado, that shade the home in the afternoon. 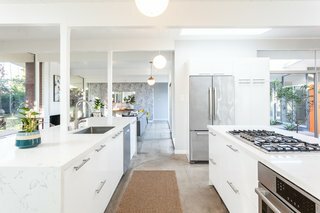 586 S. Woodland Street is now being listed for $1,100,000 by Kelly Laule of Better Living Socal Realty.